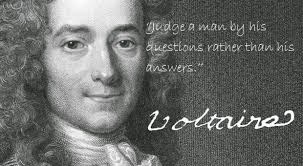 Voltaire was the pen name of François Marie Arouet, a French satirist, philosopher, historian, dramatist, and poet who lived between 1694 and 1778. His legendary wit and views on many topics, including organized religion, often got him in trouble. Reaction against his writings forced him to leave France for long periods, do a stint in the Bastille. But it never silenced his quill. 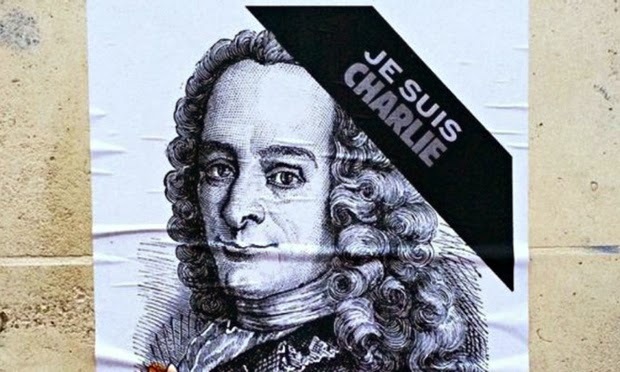 In the wake of the Charlie Hebdo massacre, French book buyers are turning to him, one of their grands philosophes for enlightenment. Publisher Gallimard has gone back to press printing more of his famous Treatise on Tolerance. 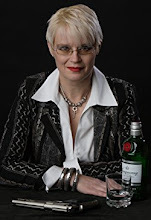 Published in 1763, it is now a French Bestseller topping the bestseller lists. 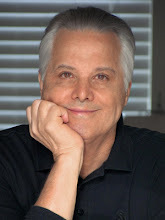 How many authors have that happen in their lifetime, much less more than two hundred years later? 5) “Work keeps us from three great evils, boredom, vice, and poverty. Thanks, Cara. I may need to do a little serious reading and studying to broaden my perspective. Make me want to read Candide now! When this horror occurred, my wishful thinking was that the terrorists had in some way sabotaged their own purposes. It was a specific target they highlighted: free speech. I still hope it doesn't fade into yesterday's news. Candide. What I most remember is the ending, the main characters debating which was worse, pain or the boredom they were now suffering. The word ennui is French and has worked its way into many languages and became a major theme in western literature. 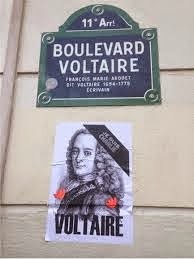 I don't know if Voltaire was but one among many who wrote about it, or whether it originated with him as a literary theme. 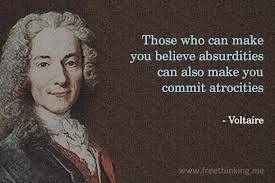 Voltaire never fails to captivate me with his take on EVERYTHING. Mark Twain and Will Rogers sort of follow in his footsteps, but he definitely wins on the hair.